The annals of Catholic hagiography contain many legends which are recorded in documents written long after the lifetimes of various Saints, but which per se present no particular challenge to the credulity of anyone who believes in a personal God and the reality of miracles. Many Saints have lived in such a way that we would not expect to find material proof of their doings, any more than we would expect to find a first-century shop with a sign over the door reading “Joseph son of Jacob, Carpenter.” For such as these, we must trust to Providence, the good faith of their biographers, and the Church’s tradition. There are others, however, which even a very basic knowledge of history demonstrates cannot be accepted as reliable; such a one is the legend of St Ursula and Companions, Virgins and Martyrs at Cologne in Germany. 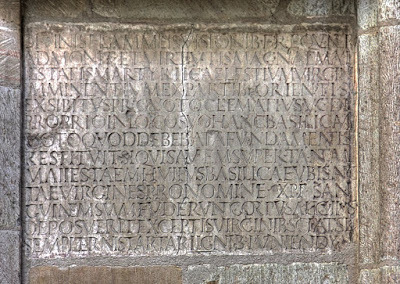 The vast collection of hagiographical learning known as the Acta Sanctorum devotes 230 pages of small type to parsing out how their legend developed from a single inscription in a church in that city into a famously extravagant story. Here we can give only a brief summary of the case; a fairly thorough account is given in the relevant article in the Catholic Encyclopedia. 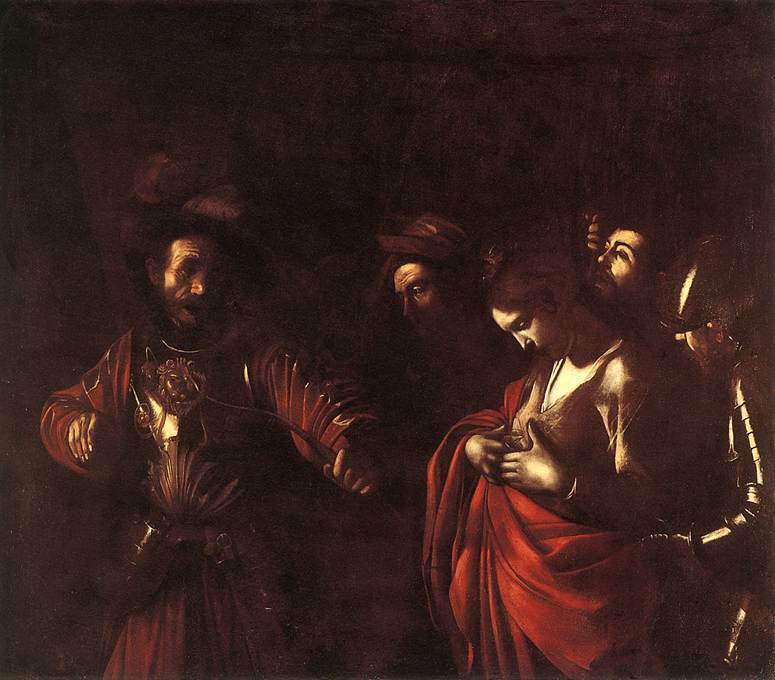 The Martyrdom of St Ursula, by Caravaggio, 1610, generally believed to be his last work. 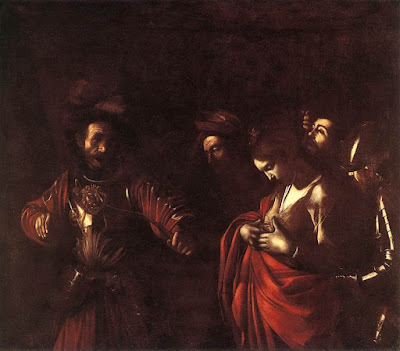 The Saint is shown at the very moment she is struck in the breast by an arrow, an example of the vivid realism for which Caravaggio was praised by many as the greatest painter of his times. 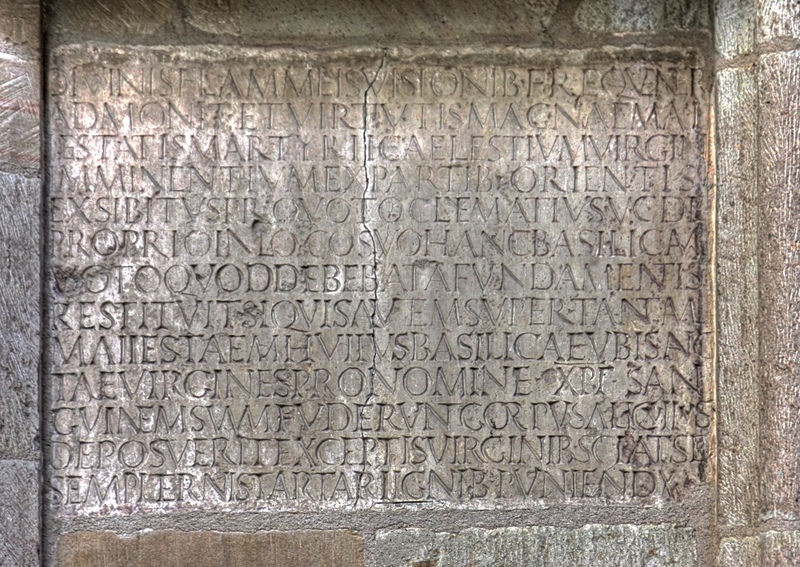 The Clematius inscription, now in the Basilica of St Ursula in Cologne, built in the 12th century over the site where the putative relics of the Virgin Martyrs were discovered. The inherent logistic improbabilities of assembling and moving such a company are obvious, especially given the chaos of the mid-5th century, to which the medieval legend assigns their martyrdom at the hands of the Huns. In the year 1155, a large cemetery was discovered at Cologne, and the remains therein were accepted as the relics of the 11,000, notwithstanding the presence of many men and children among them. A later elaboration identified both the epitaph and relics of “Pope Cyriacus”, who, after receiving the future martyrs in Rome, abdicated the papacy in order to accompany them back north, where he shared in their martyrdom. This version goes on to say that the cardinals, displeased at the abdication, later expunged his name from the catalog of the Popes, bringing the story down to the grotesque level of the Pope Joan legend; but the story is even found in a breviary printed in 1529 for the use of the Franciscans. 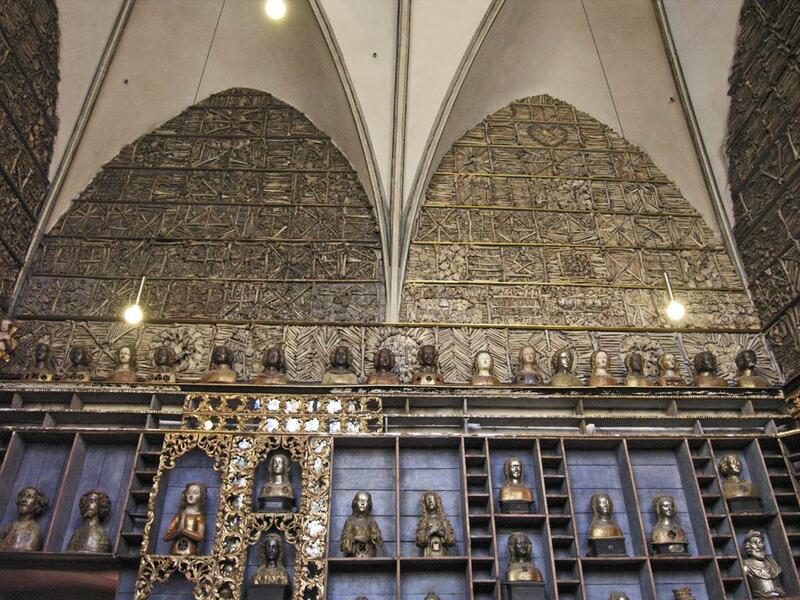 Relics of the 11,000 displayed in the crypt of the Basilica of St Ursula at Cologne, known as the Golden Chamber. Devotion to these Saints was very strong in the Middle Ages, despite the reservations of scholars who identified the incongruities and anachronisms in their legend. Among the Premonstratensians, who took their liturgical use from the area around Cologne, their feast was celebrated with an octave until the early 20th century. St Angela Merici gave the name “Ursulines” to the religious congregation she founded in 1535, the very first women’s teaching order, and before that, Christopher Columbus chose to honor them in the naming of the Virgin Islands. 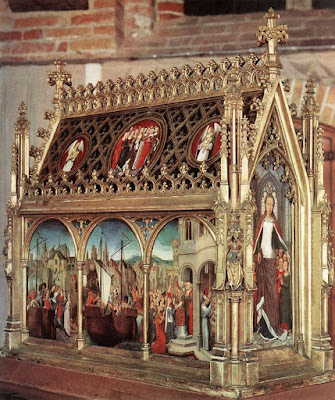 In the Tridentine liturgical books, however, they are treated with great reserve, kept only as a commemoration on October 21, the feast of the abbot St Hilarion; St Ursula is mentioned by name, but no number of her companions is given. It is supremely ironic that they should share their feast day with a Saint whose life is quite well documented, by no less a personage than St Jerome; however, neither feast was retained on the Calendar of the post-Conciliar reform. Numbering as they do in the thousands, their putative relics have been given to churches all over the world. In 1489, the Hospital of St John in the city of Bruges received a portion of them, and commissioned the painter Hans Memling to make a shrine in which to house them, one of his masterpieces. 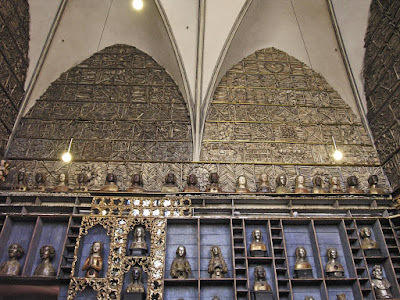 The Gothic shrine has six panels on the two sides showing the story of the Saints. The Arrival of the 11,000 at Cologne (left), Basel (middle), and Rome (right), where they are greeted by Pope Cyriacus. (Click image to enlarge) In the background of the Cologne scene is depicted the cathedral with its unfinished bell-towers; work on the towers was broken off in 1473 and not resumed until 1842, and the bells installed in the 1870s. The crane on one of the towers remained a landmark of the city for hundreds of years. 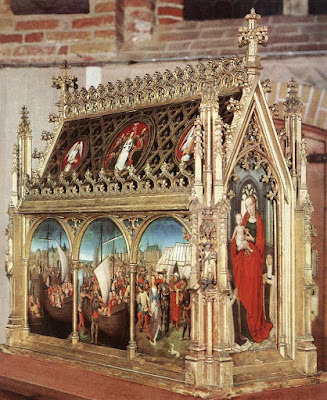 On one of the short sides, St Ursula is depicted with many of her companions kneeling under her mantle, a gesture of protection often used for the Virgin Mary, who is shown on the other side with two nuns kneeling next to her.